Two ancient herbs, Golden Chia from the West and Ginseng from the East combine to create a modern miracle, the Forever Gin-Chia. Let this powerful combination of herbs give your body back what your busy lifestyle takes out. Can help increase stamina and endurance. Golden Chia, or North American Sage, or Salvia columbariae , was used by southwest Native American Indians in the US at the turn of the century for its life-sustaining properties. Golden Chia contains healthful polyunsaturated fatty acids , antioxidants, fiber, and protein. Ginseng is legendary as a tonic, earning its name as the "King of Tonics". It contains saponins , making ginseng an adaptogen (a compound that adapts its effects depending on the needs of the body). Ginseng is also a potent antioxidant. Together these two legendary herbs pack a powerful punch into Forever Gin-Chia to help you get through the day. 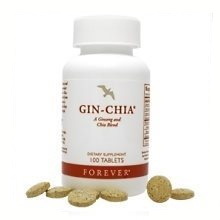 Take one tablet Forever Gin-Chia three times daily as a dietary supplement.